Sometimes, the best way to write about a trip to a foreign country is to start with the basics. And what’s more basic than restrooms? The first public toilet I visited in Cuba was also the worst. I don’t have photos to document the experience because tourists who chose to take cameras or cell phones into San Pedro de la Roca Castle, the old Spanish fort in Santiago de Cuba, were required to pay five CUCs (about five dollars) for the privilege. My words will have to suffice. Along one wall of a small stone courtyard were three heavy wooden doors. A young woman sat near them, a sparse roll of toilet paper on her lap. I handed her a coin and she handed me three squares of tissue and pointed toward the middle door. I entered a high-ceilinged room with a small window at one end. Against the back wall was a filthy commode with no seat. 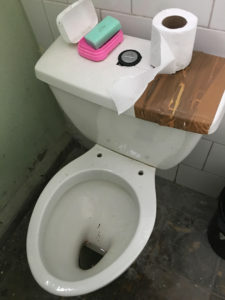 I would soon discover that toilet seats in public restrooms are nonexistent, but this toilet was unique even for Cuba. It wasn’t attached to plumbing. On the wall opposite the commode, two rusted metal pipes stuck out from the wall. The sink they once serviced was gone. Beside the commode was a cardboard box, the depository for used toilet paper. When I exited the bathroom and thanked the attendant, she smiled and dipped a coffee can into a plastic bucket filled with water. Then she disappeared into the bano I’d just vacated. The flush, obviously. The other banos I visited weren’t much better. Most had an attendant asking for, and sometimes angrily demanding, payment. The nicer banos had a sink that trickled cold water. Some even had a sliver of grimy soap beside the faucet. None offered any way to dry hands other than wiping them on your clothes. The Graphics Society of Cienfuegos, an artists’ collective that specializes in printmaking and which also hosts art activities for mentally handicapped children and adults, had the nicest public restroom by far. It was free, had a real flusher, and even offered a use-what-you-need roll of toilet paper and a fresh, clean bar of soap. Because it’s complicated for U.S. citizens to enter Cuba directly, I was part of a “people to people” tour that began and ended in Jamaica. Our cruise ship circumnavigated Cuba over the course of seven days, going ashore at three different ports—Santiago, Havana and Cienfuegos. We returned every evening to the ship. My modest but comfortable cabin boasted its own private bano, complete with hot and cold running water in the sink and shower, an abundance of fragrant liquid soap and clean towels, and a commode—scrupulously scrubbed and sanitized twice a day by the cleaning staff—with a powerful flush. And, yes, all the toilet paper I could ever wish for.